ID Cards Application is best featured ID cards designing software provides facility to design perfect industry specific ID cards for employee, students, visitors, staff and other members in simplest way. ID Cards Application provides several predefined designing tools such as pencil, text, images, pictures and other similar tools to design customized ID cards without requiring any other utility. ID Cards maker software provides feature to create ID cards either starting new ID card format or edit existing ID card format according to user choice. ID Cards Application supports to design ID cards with adding photos, logo, barcode and other required objects to make more attractive ID cards. With the help of ID Cards maker software user can create colorful and nice-looking ID cards in few simple mouse clicks without any technical help. ID Cards Application provides password facility to set password to prevent from unauthorized access during designing process. ID Cards maker software allow to save generated ID cards on specified location in PC for future modification and print in modified form when required without wasting time to create new ID cards. ID Cards Application provides facility to print multiple copies of same ID cards simultaneously without using any other utility. With the help of ID cards maker software user can print ID cards in different shapes and sizes like rectangle, rounded, ellipse and in other shapes according to their requirements. Software features: * Easy to use and cost-effective software to design ID cards including photo, logo, barcode, text messages and other required elements. 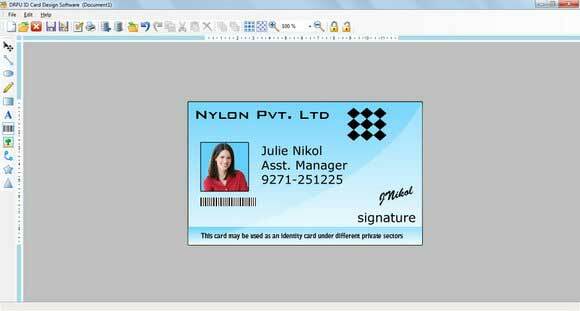 * Provides predefined designing tools like pencil, pictures and different symbols to quickly design customized ID cards. * Allows printing colorful and attractive ID cards with solid color, background and gradient in preferred style and shape. * Provides facility to save created ID cards in PC for future use and print in modified form when required.